Michael and Caroline McCornick run the 600 acre Barquhill Farm near Wigtown with their son William, 20, and younger sons Mark, 18, an apprentice agricultural engineer and Robbie, 17, also help out. As well as running the beef and sheep unit, Caroline runs her own separate business - Caroline’s Catering - through which she provides everything from food to marquees for events within a 30 mile radius of Barquhill. At busy times of the year, mainly through the summer months, the family helps out alongside the extra staff Caroline employs. The farm carries a flock of 250 mostly Roussin cross Blackface breeding ewes, which are crossed with Texel and Beltex cross Texel rams to produce prime lambs which are sold through the ring at Newton Stewart. Barquhill was in the family in the early part of last century and Michael’s great grandfather, George McCornick, had Galloway cattle entered in the society’s first year books in the 1870s. His grandfather William also kept the breed at Barquhill until 1929. So it was not surprising that the family opted for the hardy native breed which is well suited to outwintering on the hard hill ground of the Machars area, which, despite rising to only 150ft above sea level, is mainly exposed rough ground and rock. 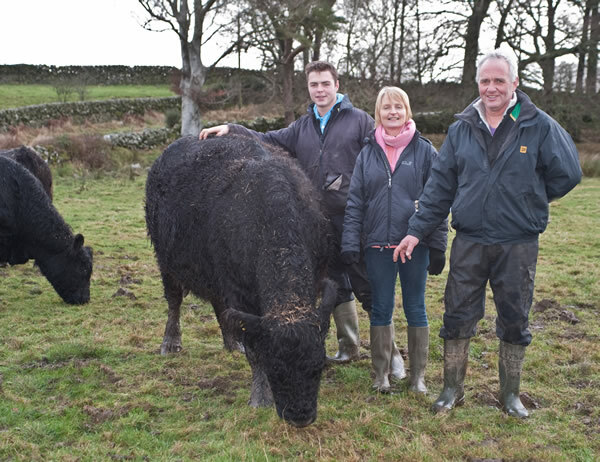 Michael and Caroline have been farming the tenanted holding since 1989 and they have been running commercial Angus cross Friesian cows, crossing them with the Charolais bull, until the decision was made to start a Galloway herd. When Michael and the family set out to establish their new Barquhill herd of Galloways they were looking to breed a modern cow with scale and conformation and an average weight of 550kg to produce good finished cattle and pedigree bulls and, eventually females, for sale. A pedigree breed further fulfilled the wishes of the McCornicks’ three sons who are all keen on showing cattle. The foundation females were mainly in-calf heifers bought in 2006 from Blackcraig, Nethercleugh, Kirkstead and Barlaes and the original stock bull, Blackcraig Ozzy is still in the herd. Other females from Penninghame and Klondyke and a bull hired from Klondyke made up the nucleus of the new herd. “We were looking for cattle that the three boys could show and a native breed which we could afford to go into which had scale. We only have 150 acres of ground that we can apply fertiliser to and make silage from so we needed a breed that was cheap to keep,” said Michael. “We soon realised how well they suited and made good use of our rough ground. They are great grazers - they will graze anything,” he added. Galloway cattle are in increasing demand for environmental grazing schemes and dairy farmers are using the bulls for easier calving on heifers. The herd now numbers 30 breeding cows and 110 head of Galloways in total. Heifers have been kept to build up herd numbers and now around 70 per cent of the herd is home bred. Optimum herd numbers are around 50 breeding females with followers and the intention is then to concentrate on closing the herd to reduce the risk of disease. The last bought in heifer was from Blackcraig in February 2011. Two white bulling heifers were bought - mainly for Caroline’s keenness. She also manages to find time away from the catering business she set up eight years ago to breed and show Call Ducks and hens. Australian and Canadian bloodlines have been used in the herd to give stature - stock bull Ozzy has Australian breeding. As well as size and conformation, good temperament is another priority trait for the McCornicks with so little labour to rely on. The cattle are easily outwintered which saves on labour and the need for buildings The breed is naturally-polled which again is labour-saving. Most of the herd calves outside in November to fit in with the pedigree sales. The cows are easy calving with very few assisted births and most produce a calf a year - fertility is good despite it being a relatively young herd. Heifers are calved at three years old. The cows are overwintered on silage and a handful of meal a day. “I reckon it costs the same to winter a Galloway cow and its calf as it does to outwinter a commercial cow which is due to calve in the spring,” said Michael. “They are cheap to keep and healthy with little veterinary costs. As well as the Blackcraig bull current herd sires include the four year old ET bull Barquhill Cosmo, a full brother of Blackcraig Kodiak which was interbreed champion at the Highland and Great Yorkshire shows in 2009. A bull Highland Monarch of Gallway is also shared with fellow pedigree breeders John Finlay, Blackcraig, Corsock, Dumfries, and David Cornthwaite, Balgray, Lockerbie. Home-bred bulls have been sold successfully. Barquhill Coca Cola was sold at the February 2012 Castle Douglas sale for 4,000gns to Clive Hamer, Hirnant Farm,Powys, Wales. Their first bull sold, Barquhill Black Prince, was bought for use in Poland. Some steers not kept as breeding bulls have been put through Caroline’s business receiving great feedback for the eating quality of the meat from customers. 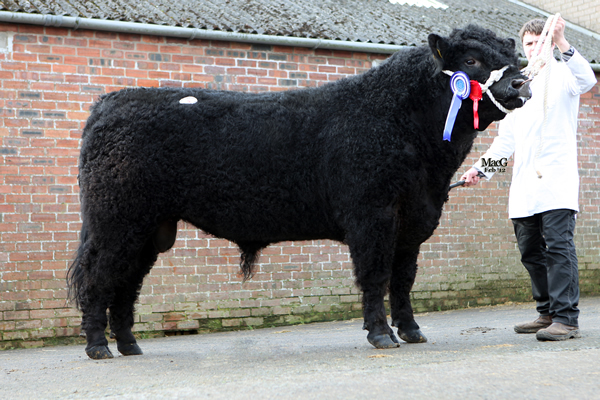 A steer recently sold through the ring at Craig Wilson Ltd, Ayr, for £1,300 weighing 655kg. At the 2012 ScottishWinter Fair, Robbie and William showed two pure bred Galloway bullocks. A 29 month old Dun Galloway steer which picked up a third prize ticket in its class was sold for 215p per kg weighing 710kg. The other 18 months old steer was brought home. A home-bred two year old bull, Barquhill Dominator, which was shown at the Royal Highland in the summer, will be sold at the February society sale in Castle Douglas. He has been running with a small batch of heifers. The boys also have a flock of 10 Ryeland sheep which they show and they share a ram with Andrew Hunter Blair at Nethercleugh. www.atasteofgalloway.co.uk From field to plate: Taste of Galloway. We are a working Farm Based at the village of Thornhill, Dumfries & Galloway. www.blackface.co.uk Buy beef, lamb, award-winning mutton, haggis, Iron Age pork, oven ready grouse, partridge, bronze turkeys and venison meat online. www.kilnford.co.uk Kilnford is a vibrant food hub that aims to provide the very best local food that is available in Dumfries and Galloway. If you would like your business to feature on this page, please contact the office.